Rated 5 out of 5 by nelliebj from Another Winner! Loving this game. Not as easy as it first seemed but lots of opportunities for power ups and you can get through it. It does take some strategy, especially when you start getting through the first ten or so levels. There are plenty of wild cards but few will work with the J, Q and K so you have to watch out for that. An Ace will work with the King and a ten will work with the Jack but nothing with the queen! So watch your remaining cards and your remaining wild cards if you want to win the level. I really enjoyed the first 30 minutes of the demo so bought the game. Love solitaire games and this one is a winner. Rated 5 out of 5 by mrm2006 from Best Solitaire Game of 2015 .... so far - lol I LOVE LOVE LOVE solitaire games. But, a solitaire game won't hold my interest unless it contains a LOT of entertainment. This game gives you entertainment in spades! HAH! I made a funny - lol lol lol. The graphics are amazing! The background will change to match whatever part of the story you are working on. For instance, a sinking ship - OH NO! Gotta go check it out! The music is perfectly done without being monotonous. The gist of the game is like any other hi/low solitaire game. BUT, there is so much you can/have to do! There are fish encased in bubbles that you can/have to free. You can choose NOT to free them but, me? No way, I had to free those fishies! You not only earn bonus cards but you earn pearls while you play that you can use in the shop. AND, there's a casino where you can try to earn more cash! You can change the backs of the cards to many different colors/scenes. There are 2 difficulty levels. And, you can earn up to 3 gold stars per level. You can go back and replay any level you want - if you want to. lol The first level is also your tutorial .... but those who don't need it can just click it to stop. 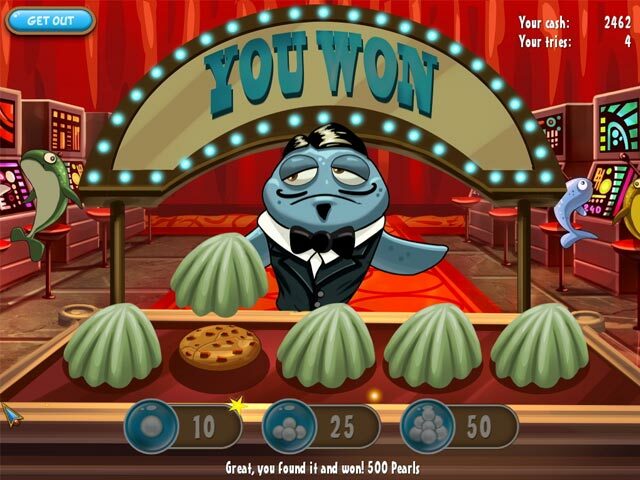 A great storyline, things you can/have to do during the game play, changing backgrounds, a casino, earning pearls, surprises during the game play and MORE! But, don't think this is an easy game because it gets more and more difficult as you go along. I had to replay one level so many times! And I'm great at solitaire! So much entertainment value in one little game? Oh yeah! For all these reasons and MORE MORE MORE, this game is a definite purchase for me. Great for beginners and experts alike. When the demo ended, I got my personal "wow" factor and knew I had to have it. 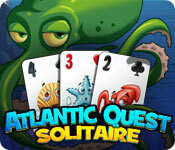 Come along and join me .... under the sea .... and have a blast playing this amazing solitaire game! ENJOY! 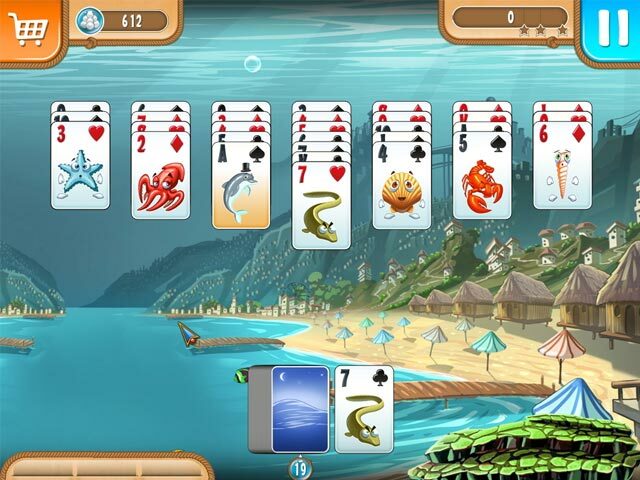 Rated 5 out of 5 by pennmom36 from Everything's Better Under The Sea What a great game of solitaire, the entire family will enjoy this whimsical, nautical themed game. This is a Higher/Lower game requiring you to clear the board by clicking a card one higher or one lower than the deck card show, while attempting to make large combos. 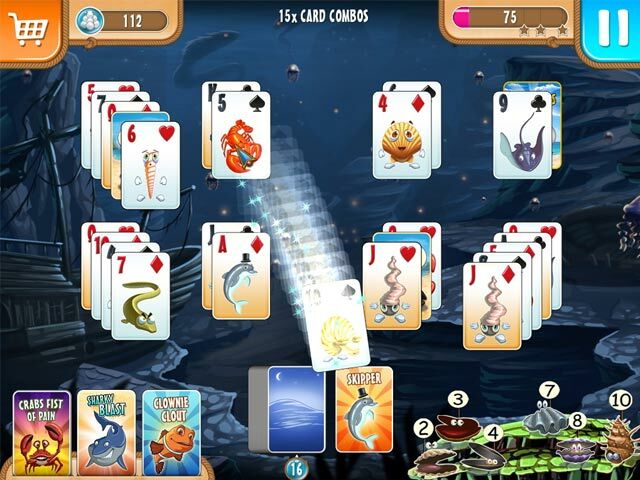 Each hand will have ill or imprisoned fish in a bubble, to free them you have to make a combo of a specific amount of cards as shown under the bubble, some require several combos. Occasionally, you will uncover Fish Helpers that are card specific wildcards, and there are trophies to earn as well. Some of the cards are blocked with Plants, Oil or even Sleeping Clams, and cannot be played until a special card is uncovered to remove the blockage. You can choose to allow the cards to gently "sway" as if they truly are underwater, which is a cool feature I haven't seen before. You can spend the pearls you earn playing, to purchase upgrades in the shop. The Skipper is a wildcard that can be used in place of any card you choose, Clowny's Headbut destroys a single card, Sharky's Flipper-Flapper smashes a stack of cards, Inky's Tentacle grabs several cards and destroys them, Crabby's Claw allows you to click away as many cards as you can for 5 seconds (how cool is that!) the Big Turnover opens all aquatic plant, oil and clam covered cards, and finally, the Random Extra card which randomly chooses one of the bonus cards. This game reminds me of Seven Seas Solitaire which is a pirate themed solitaire game, so pull up a beach chair and enjoy! Rated 4 out of 5 by Gamevirgin from No Undo Button Really cool game but no undo button and could be a little longer. It has 74 levels and each has only one round unlike Fairway Solitaire which had like 9 rounds per course. Why did Bigfish remove it, again? Anyways, I really love the underwater theme! Beautiful game. Rated 4 out of 5 by verimeri from a little confusing at first It's hard at first to figure out all the ups and downs and power-ups. My one negative is I can see no do over like if you miss a play you cannot go back even one card. Rated 4 out of 5 by Ben351 from Fun, Colourful Game Nice, colorful, fun game. I enjoyed the gameplay and the underwater theme. Rated 4 out of 5 by RasmusB from Very good Solitaire game This is one of the better solitaire games out there. The funfactor is good, seeing that it's quite challengeing and the bonus cards is always usefull. The gfx is well done and pleasing to the eyes. And you get quite a few pears, which you can spend in the shop. For more usefull bonus cards. One thing i do miss, though, is a undo button, which also should be upgradable, maybe with a purchaseable bonus card. Rated 3 out of 5 by cowclaudia from As above just OK I purchased this because I love Atlantic Quest and also solitaire games but was very disappointed. Game is a bit confusing at times and there's no undo button which to me is a must on solitaire games. You can get power ups but they don't last - they have to be purchased time and again and if you fold you have to have a certain amount of pearls accumulated to buy a new deck - if not fold or retry. This may not be a problem for some so won't not recommend it but keep it in mind. Rated 3 out of 5 by Stephen0118 from An ok game This is an ok golf solitaire game, where you have to go either higher or lower by one. The only reason why I only gave it three stars is, as they've said in the forums, that there's no undo option. You miss a card, that's it. No option to buy an undo either. At times, you'll find yourself stuck on a level because either there's no way to undo a mistake move or you just simply run out of cards unless you've saved 850 pearls to get more cards. I got this game with my club credits, so I'm glad I didn't pay for it. I'll give it a few more tries before I'll delete it. Rated 3 out of 5 by SaintJed from Good Kids Game OK solitaire game but more in line for kids and players just wanting a silly chill out. It does make you think of Nemo. Rated 3 out of 5 by Mazeo from Good Time Filler I've played a few solitaire games and this one is not too bad. I don't think it is extremely difficult, ..... but that tended to make it a relaxing way to pass the time. If you collect the correct cards to use, and collect enough "pearls" then you should be able to complete the game without too much trouble. Rated 2 out of 5 by Itsupikachu from Chef I like solitaire and have several. When I saw this one, it looked like fun and the reviews made me really interested so, since I had a coupon, I decided to get it. The graphics are great and really colorful but the game play was disappointing. At first, I was really loving the game but it wasn't long before I discovered that it was pretty difficult to win with the cards dealt. I lost so many that it was no longer fun. Maybe, I'm missing something. If so, someone please let me know. Rated 1 out of 5 by mamapug from Save your time and money! I wanted to like this game. Looked really cute. However, you can only get so far and it becomes impossible to progress any further. I am very very good at this type of game, but this thing is just no fun at all. Just frustrating. Too bad............it had such potential.